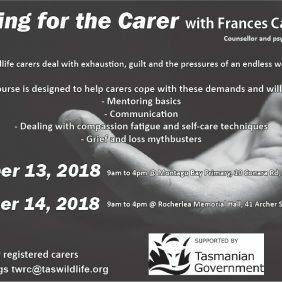 The Tasmanian Wildlife Rehabilitation Council is a collective and collaborative organisation representing wildlife carers which works for the successful rehabilitation and release of native Tasmanian wildlife. – Be a voice for all registered Tasmanian wildlife carers. – Improve knowledge through resource-sharing across the carer network and the distribution of accurate contemporary information and research relating to all aspects of wildlife care, rescue, rehabilitation and release. – Provide education and training opportunities to achieve consistently high standards in wildlife care and excellent welfare outcomes. – Assist in the development of state and national Codes of Practice, ensuring Tasmanian carers to continue to meet and surpass existing codes. – Liaise with government departments and other relevant bodies and organisations on native wildlife issues. – Provide representation on relevant committees. – Establish portfolio working groups and seek wider consultation to assist them in carrying out their functions. 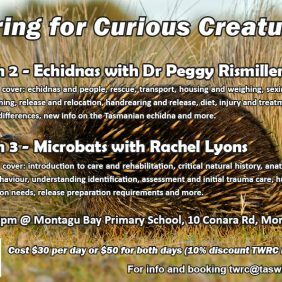 – Increase community awareness, interest in and support of Tasmanian wildlife welfare and conservation. – Source appropriate funding to support the Council’s work. – Encourage high standards of ethical conduct, honesty, integrity and compassion.